Why Are Helicopters In Wilderness? At nearly 2.4 million acres, Idaho’s Frank Church-River of No Return is the largest wilderness area in the Lower 48. It cuts Idaho in half, a huge roadless chunk of craggy canyons, alpine lakes and deep forest. You might think that because it’s already protected as wilderness-the strongest form of land protection in the United States-it’s pretty much in the clear. But in an era where public lands face unprecedented threats, wilderness areas are no exception. On January 6, ignoring protests from local environmental groups, the U.S. Forest Service granted the Idaho Department of Fish and Game a permit to land helicopters in the Frank to radio-collar some elk. Normally, human manipulation of predator-prey dynamics is barred in wilderness areas. But Idaho officials were concerned that elk numbers had dropped by 43 percent between 2002 and 2011, and they wanted to know why. After fitting 60 elk with GPS-tracking collars, Idaho Fish and Game took the opportunity to collar four wolves-something it didn’t have permission to do. The agency reported its transgression to the Forest Service, and the Forest Service responded with a two-page notice, requesting information about why Fish and Game collared the wolves and additional steps the agency must take if it wants to fly helicopters into the wilderness again. Fish and Game hasn’t commented on why it collared the wolves, but four environmental groups suing to stop the helicopters-Earthjustice, Wilderness Watch, Friends of the Clearwater, and Western Watersheds Project-say they have a pretty good idea. More wolves equal fewer elk, and elk are moneymakers for Idaho Fish and Game. 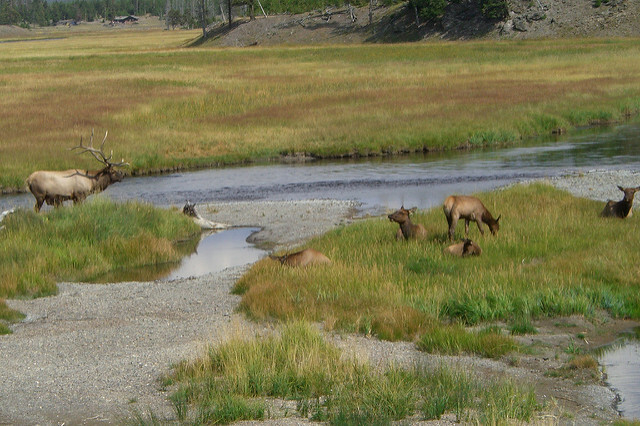 Roughly half the agency’s budget comes from hunting and fishing licenses, mostly from out-of-state hunters who pay good money for a trophy elk. Wolves, on the other hand, take money away from the local economy by preying on ranchers’ calves. Then there’s the issue of helicopters landing in the wilderness at all. When the Wilderness Act was passed in 1964, the intent was for wilderness to be free of motorized intrusions. I worked on a trail crew in the Frank Church in 2009, and that meant chainsaws were off limits. We had to saw through fallen ponderosa pines with crosscut saws, taking turns when our arms got too sore. It was grueling, sweaty work, but it felt right that there were still places where you could escape your neighbor’s incessant lawn-mowing or the buzz of generators emanating from glowing RVs-places that were refuges for humans and wildlife alike. Just 2 percent of the Lower 48 is designated wilderness. Lately, though, the concept of wilderness as a refuge has taken a beating. There have always been exceptions to the no-motors policy: chainsaws and helicopters are allowed when they’re necessary to ensure the health and safety of people, landing strips for bush planes and motorboat permits are grandfathered in, and motorized equipment can be used to fight fires. But last year, the Forest Service approved a mining company‘s request to build a four-mile road and make as many as 571 trips a year with bulldozers, dump trucks and drill rigs into the Frank Church. There are similar mining claims in Montana’s Cabinet Wilderness and Oregon’s Kalmiopsis. And in Utah, draft legislation recently introduced by a trio of Congressmen seeks to protect 2.2 million acres of canyon country as wilderness, but critics like The Wilderness Society say the bill is packed with unprecedented loopholes that do more harm than good. One provision would give the state free rein to conduct predator control by helicopter within new wilderness areas; another would let ranchers drive ATVs through wilderness to feed their stock. Wilderness advocates are fighting these encroachments, but it’s an uphill battle. Between 1990 and 2009, Congress passed an average of 14 new wilderness bills a year. In the six years since, it’s only passed eight. At least eight Western states have also supported measures to transfer public lands to state control. And while most wouldn’t explicitly affect wilderness, they’re yet one more indication of the growing polarization of public lands. The less state and federal agencies agree on how to manage wilderness and wildlife, the more chances for missteps like the helicopter incident in Idaho.